Ready for the third release in The Free Orchestra series? Every last Thursday of the month we are posting a new, free instrument, featuring samples from our extensive, cinematic catalog. It seems Halloween came early this year. TFO #3: Ghostly Clusters is a set of eerie, otherworldly string, brass & woodwind effects, ready to send a chill through your spine… and that of the audience! A unique selection of textures for adding suspense and tension to any thriller, horror or ghost score. These are original, acoustic recordings, using specific orchestrations and more experimental playing techniques to evoke a spooky, suspenseful atmosphere. No sound design or post-production effects were used. Make sure you hit the B2 key as well, to which we mapped a deep, soft bonus gran cassa thud. All Free Orchestra patches feature a dedicated Kontakt interface with a set of useful controls to adjust the envelope, reverb, filter and other elements of the instrument. The TFO #3 UI offers a Spooky control that gives the instrument that extra, bone-chilling touch. The UI also allows you to reverse the samples on the fly. 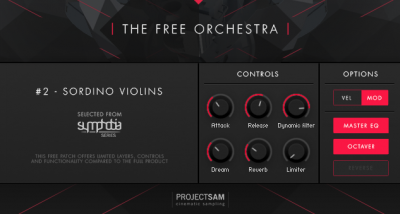 The Free Orchestra does not come with a Kontakt Player license, which means the full version of Kontakt is required. 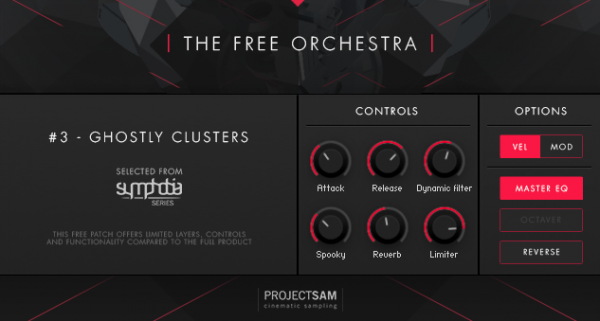 All Free Orchestra patches have been formatted for Kontakt 5.6.8. Ghostly Clusters comes with an open 44.1 kHz/24 bit sample pool. This means that you can directly access the wave files and use them on any platform that can handle wave files. Example are Ableton, Cubase, Pro Tools, FL Studio, HALion, Falcon – or your old hardware or Eurorack sampler. Part of the effects samples have loop point information saved in the file headers. Most samplers will automatically read these loop points when importing a sample. These looped samples also have a loop point cross fade rendered into the audio. If you do not set the samples to loop, there will be a noticeable artifact at the end of this cross fade, where the sample is supposed to loop. Please note that while you are more than welcome to use The Free Orchestra in commercial projects, it is not allowed to redistribute or resell these sounds without prior, written permission of ProjectSAM! Get Ghost Clusters now by clicking the Get Now button. It will be automatically added to your ProjectSAM account, ready for downloading!